This is actually painting #8 of my 150 Challenge. 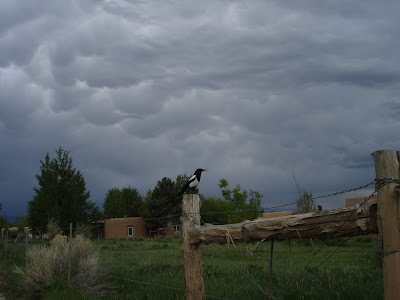 It's from a scene at my relative's place up in Taos. These trees are right outside the door of his home. CLICK ON THE IMAGE ABOVE TO SEE NEW 150 CHALLENGE PAINTINGS! 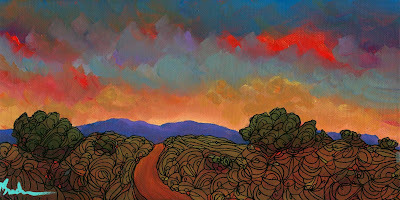 CHECK OUT THREE NEW 150 CHALLENGE PAINTINGS! Only a few more to go and I have my last 16 canvases all set out with little notes about what they're going to be. 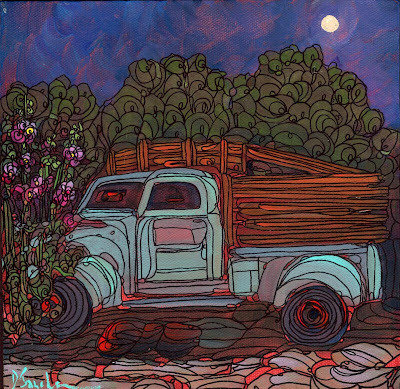 I'm feeling really excited about the upcoming show - I will deliver all of the paintings to Weems Old Town on either Tuesday evening or Wednesday morning and then probably go home and cry a little. Just kidding! It is kind of sad to be almost done - I've never been more proud of any work I've done since I started painting, I included amost everything I've always wanted to paint, and tried several new subjects, unsure about my ability to interpret them up to my standards. I think I succeeded pretty well. I am just so excited about seeing them all on the Weems wall that I can't hardly wait. At times during the last six months, I have felt like life was passing me by in many ways; I don't cook very much any more, my house is not spotless, my poor husband doesn't get much attention, I've done no yardwork, and I am barely making it to the gym. But then I realized - THIS IS MY LIFE AND I LOVE IT. I do have to pay more attention to my husband tho, he is great for putting up with me. Click on the image above to see Dee's two newest 150 Challenge paintings! Click the link below to see my three newest 150 Challenge paintings! This is my newest dancer painting in progress, I should be finished today. 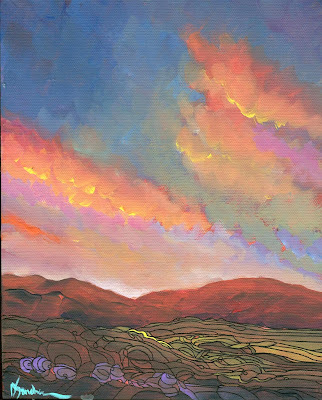 I put her in a landscape of flat top mountains, sagebrush, and chamisa. Tomorrow is "commission" day. I have 8 small paintings I am completing that have to be shipped out and three larger (12x16) pieces that a very patient friend has been waiting for. After my 150 Challenge show is over, I will be working on completing as many small lavender paintings as possible by July 10 for the Los Ranchos Lavender Festival. It was funny, I went into my favorite antique store yesterday and they had my lavender poster hanging on the door and I didn't even see it, until they pointed it out. It looked pretty cool! 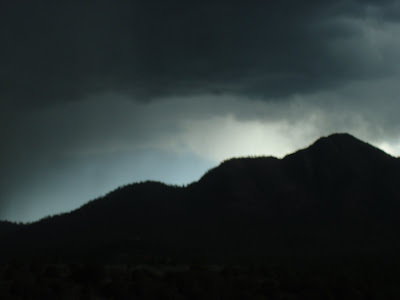 After July 12, I will be headed to Taos for a paint-out, and then a little getaway for a few days with family. I haven't flown for several years, so that should be fun. Then I have 3 months to get ready for my big show at Weems Artfest in November. And after that, I am thinking about taking 3-6 months off from any deadlines. I know, I keep saying that, but it COULD happen! This is the postcard for the upcoming 150 CHALLENGE show. If you are not on my mailing list and would like to be, please send me your address and you'll receive one of these in the mail! 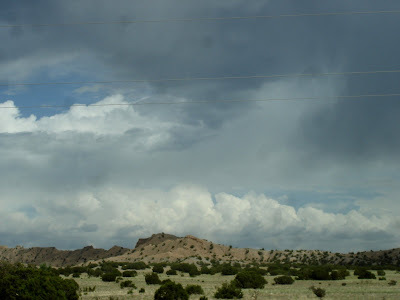 On the high road - hills near Santa Fe. The clouds were spectacular! Taos was gorgeous - we went from high 80 degree weather down to the 50's and had to put on warmer clothes when we arrived. We went to a barbeque, they had nice music, volleyball, basketball, a great bonfire, it was nice! But now, it's back to work big time for me! I have 37 paintings left! Wow, I can't believe I have painted 113 paintings since January 9th. I am lacking 3 canvases to finish the last 37, I will get those next week. I sat down this morning and stuck an image or a post-it on each canvas, so I know what the final subjects will be. I had to leave out several things that I wanted to paint - it was hard pairing it down to the final pieces. My postcard should be here Monday, I will rush it to the printer and then mail it out next week. That's 500 handwritten invitations to my show. Plus there are a couple of press releases to send out, and then I have to decide what kind of goodies I want to have at the show. As I paint these last paintings, I want to thank everyone for watching - it has been a pleasure; all of the emails, the correspondence, the people wanting to buy the paintings as I paint them, just all of it. I gave up three shows to do the 150 Challenge, and I am so excited to see them all on the Weems walls - will they all fit on the walls? We are going to hang them with a number, so if you want a specific painting, look for that number. I would like for them to be hung in the order that they were painted but that might be impossible. Also some exciting news: WE ARE OFFERING A LARGE PAINTING AT THE SHOW FOR $150! Each person that wants this painting for $150 will put their name in a jar and I will pull out the winner. This painting will be over $1000, so someone is going home with a fantastic deal! and Friday June 5, until 6:30pm. 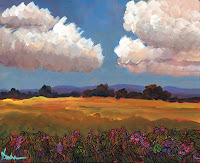 ARTIST'S RECEPTION - Friday, June 5. 5pm - 6pm refreshments, goodies, music,and fun! Please come and see the painitngs and say hi! 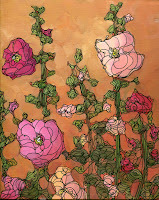 Paintings not purched at opening will be available for sale by phone starting Saturday, June 6 at 10am. You must have the painting # at the time of purchase. Weems Old Town number is 505-764-0302. 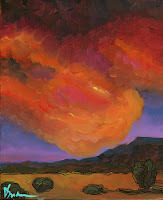 Check out new paintings #41 and #40 of Dee's 150 Challenge! 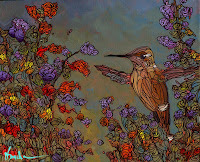 I have five paintings going now - four 150 challenges, one commission (hummingbird), and one commission (sunset) waiting in the wings. I haven't done many Canyon Women for the Challenge yet, and I like the colors in this one! I have wanted to paint a few daily paintings but time is just flying by these days! There is only three weeks left until the show. WOW! Sorry, I can't talk any more, I really have to go.....just kidding - I will have more to post tonight. 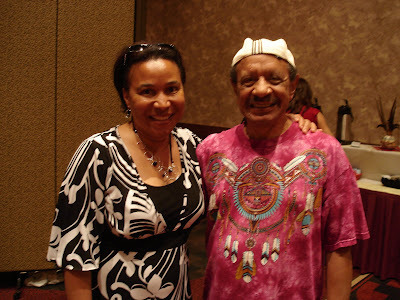 My friend Cherita and Sherman Hemsley, actor from the tv show "The Jeffersons." Gosh, it's Monday already. Again. 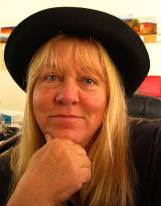 I had a nice weekend - an artist's party, an art event, and a nice relaxing Mother's Day. And I got an ipod! Lots of work for me this week. I'm reallizing that I only have about 23 days left until my "150 CHALLENGE" show at Weems Old Town on June 5th. I am getting SO excited. I had to go stock up on canvas, I got about half of what I need to finish and will get the other half next week. I still have some more supplies to get, my postcard will be on its way to me the end of this week, I have to send out some press releases, I have to hook and wire ALL of the paintings I've done so far (108), etc. I will mail out about 500 postcards, so if you're not on the list and want to be, email me! I also have two commissions to finish, plus a few for one of my very good collector friends. And I want to take the time to try and bike and swim a little at the gym every day. Whew! Than as soon as my Weems show is over, I have to paint a bunch of small works for the upcoming LAVENDER IN THE VILLAGE event. Life is good! This is my donation for the upcoming LEGACY art event. 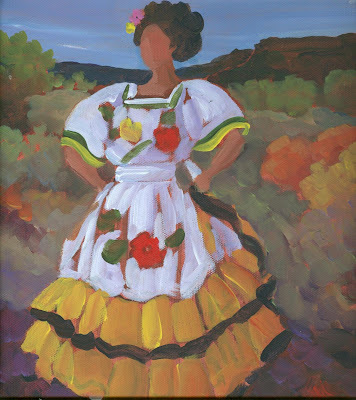 LEGACY is an event that is put on every year by the ART HAS HEART foundation, which was founded by well-known artist Amado Pena. It helps students with art educational financial aid. It has about 50 artists participating and Lou Diamond Phillips is always the highlight of the evening. He is on the board of directors and has attended every year that I've participated, I think this is my 5th or 6th year. So much fun! 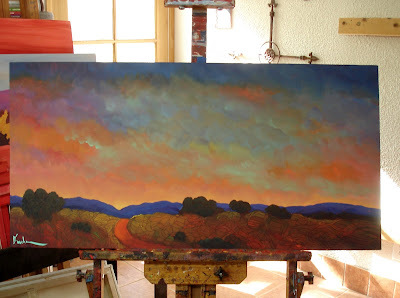 It's an 18"x36" painting and is titled, "NEW MEXICO SUNSET." I should be more original, I probably already have something with that title, but that's just what it looked like to me. I will attend the artist's party and will take photos and video for posting. 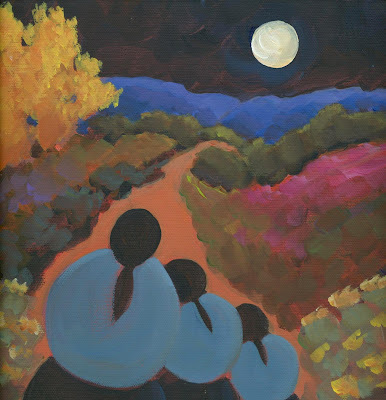 Click on the image above to see paintings #44 and #43 of Dee's 150 Challenge! Click on the image above to see 150 Challenge painting #45, "SUNBURST." 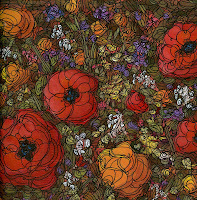 Click on the image above to see painting #46 of Dee's 150 Challenge, "POPPIES." Three descansos surrounded by summer sunflowers. I mentioned to a couple of friends that I was working on a descanso and it was bought by one of them sight unseen. 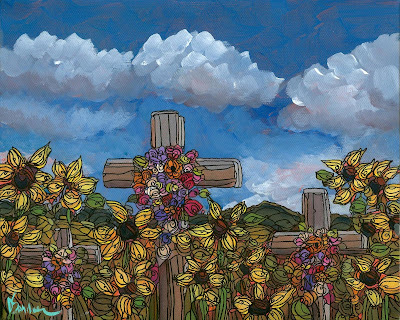 I like the feel of it, I wanted to convey the feeling that there's a lot of love within those crosses by the people who put them there. I may do a 150 Challenge painting like this. 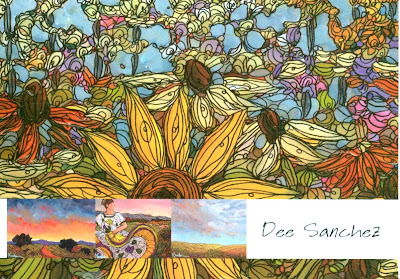 Click on the image above to see Dee's three newest 150 Challenge paintings! One of three 150 Challenge paintings I'm working on today. Plus a painting for an art event this weekend and still, a few commissions too. Lots of work this week! 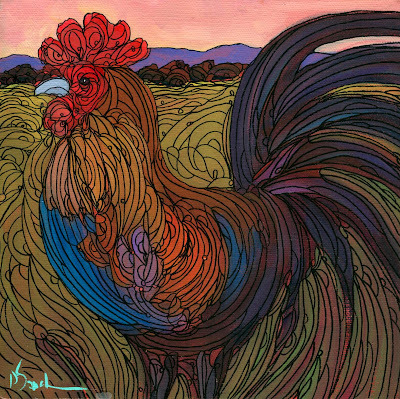 I will post the finished paintings with commentary tonight....have a great Monday. 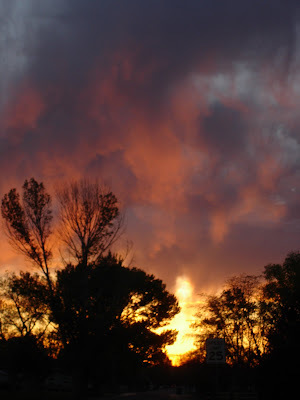 We were working outside in the front yard a few days ago, and I turned around and this was the sunset down at the end of my street. Of course, I couldn't resist - I had to run inside and get the camera and snap about a million images of it, because it changed every second. Now I HAVE to paint it! And for sure I'm removing the tall tree on the left. 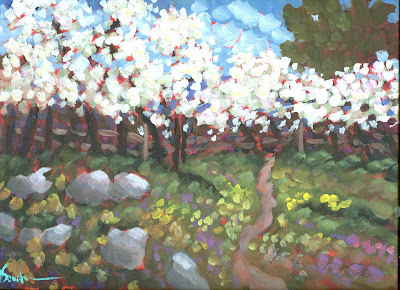 Check out the finished 150 Challenge painting #50, "SPRING DAYDREAMS."